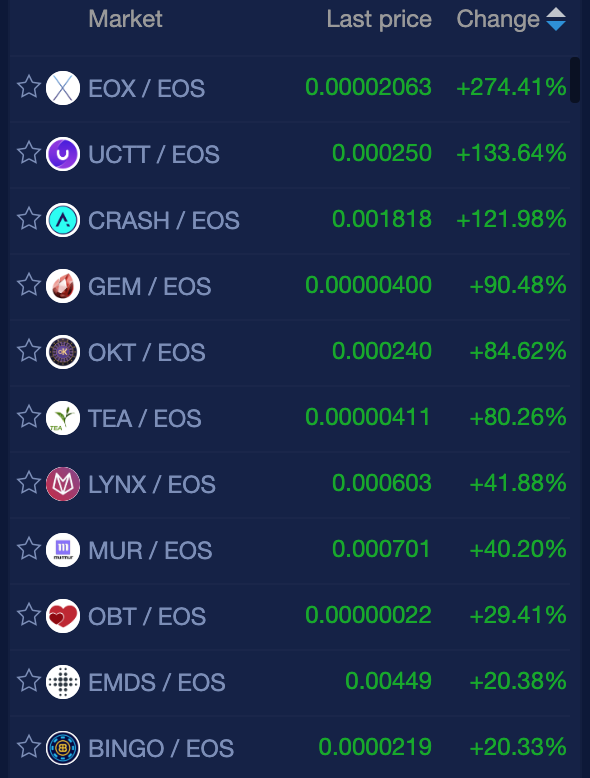 Fairly red day in the cryptomarket, but still plenty of green to be found. 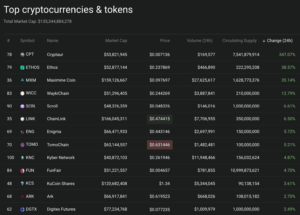 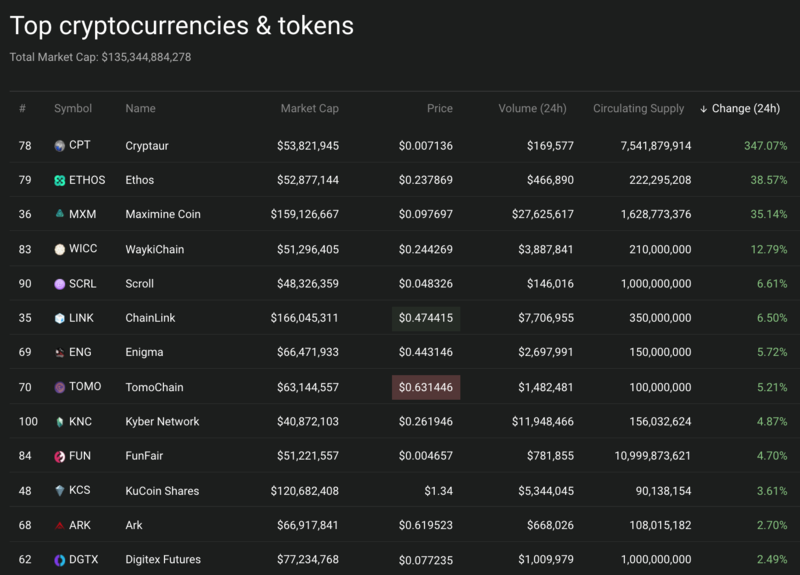 Coin360.io has Cryotaur (CPT) gaining 347% and three other coins with double digit gains within the top 100 in market cap: ETHOS (38%), Maximine Coin (MXM) 35% and WaykiChain (WICC) 12%. 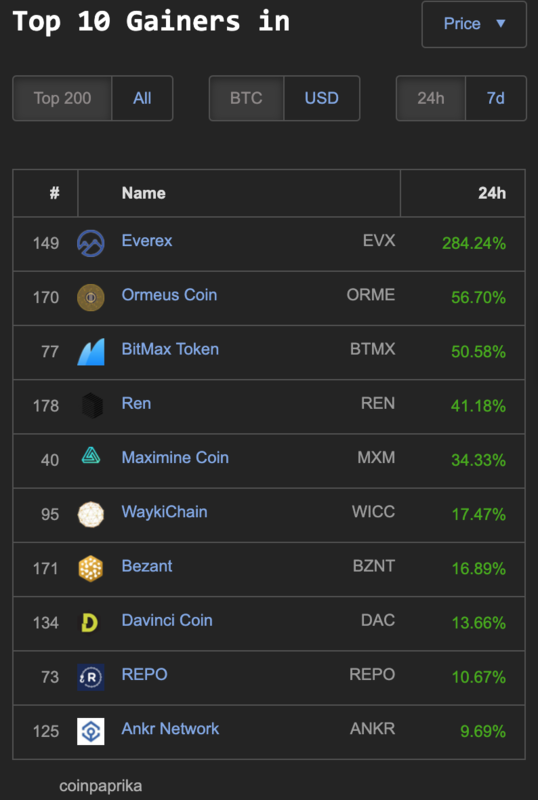 Ormeus Coin (ORME) 56%, BitMax Token (BTMX) 50%, REN (41%) Maximine Coin (MXM) 34%, WaykiChain (WICC) 17%, Bezant (BZNT) 16%, Davinci Coin (DAC) 13%, and REPO (10%). 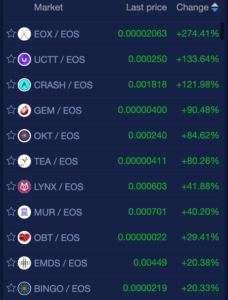 EOS tokens trading on the NewDex.io exchange lead the market and has three coins gaining triple digits today: EOX (274%), UCTT (133%) and CRASH (121%). 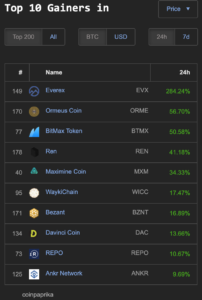 In addition there are also 14 other coins/tokens/projects gaining double digit percentages—Some of the non-gambling coins being: TEA (80%), LYNX (41%), MUR (40%), OBT (29%) EMDS (20%), PATR (20%), NFT (18%), ZKS (18%), PGL (18%) and PEOS (15%).